China has answered a call by the United States to place billions of dollars in import taxes on Chinese products with its own list of tariffs on American products. However, China’s Commerce Ministry also called on the U.S. to “pull back from the brink” and to reconsider its new trade punishments. The ministry announced the measures in reaction to tariffs the U.S. had placed on steel and aluminum imports earlier in March. The ministry said it would target 128 different U.S. import products if necessary. China’s measures include possible tariffs of 15 percent on goods such as fruits, nuts, wine and steel pipes. A 25 percent tariff on pork and aluminum imports is also being considered. 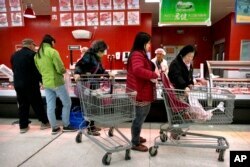 Customers shop for pork at a supermarket in Beijing, Friday, March 23, 2018. The moves would affect about $3 billion in trade if an agreement cannot be reached. On Thursday, the administration of President Donald Trump announced that it would place tariffs on about 1,300 Chinese products. Trade experts estimate that the new U.S. import taxes could be valued at up to $60 billion. The move is the result of an investigation that said China is taking U.S. intellectual property through business requirements for foreign companies. The administration is also trying to find a way to reduce the U.S. trade deficit with China, which was about $375 billion last year. Raymond Yeung is an economist for the Australia and New Zealand Banking Group. He was not surprised by China’s answer. The trade dispute has influenced stock prices in many countries. In the U.S., the Dow Jones Industrial Average index continued to move lower on Friday. The index had lost more than two percent a day earlier. 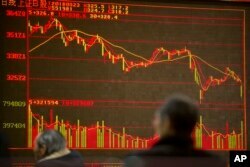 In Asia, Japan’s Nikkei stock index dropped by more than four percent. And the Shanghai Composite Index closed down 3.4 percent. Chinese investors monitor stock prices at a brokerage house in Beijing, Friday, March 23, 2018. China has noted strong reactions from many U.S. trade partners over the steel and aluminum tariffs. It has suggested that affected nations could work together to oppose the measures in the World Trade Organization (WTO). However, late Thursday, the Trump administration announced that additional countries would not face its steel and aluminum tariffs. Canada and Mexico already are not subject to the tax. Now, Argentina, Australia, Brazil, South Korea and European Union members have received temporary exemptions. Close U.S. ally Japan also is seeking to avoid the tariffs on its products. The administration said it will decide by May 1 if it will extend the exemption “based on the status of discussions” with the countries. The American tariffs have been criticized by many countries. However, countries trading with China are equally concerned about business requirements that force the transfer of technology to Chinese partners. These countries also are concerned about the loss of intellectual property, such as inventions and protected technology. And they worry that state-supported Chinese companies unfairly compete with their own businesses internationally. Alex Capri studies international trade at the National University of Singapore. 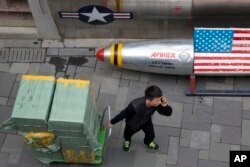 He said in recent months, China has felt increased pressure from its trade partners. A delivery man calls for directions while pulling a cart of goods past a U.S. apparel store in Beijing Friday, March 23, 2018. China denies it trades unfairly. However, officials have promised to continue to open Chinese markets to foreign companies. Chinese Premier Li Keqiang said recently there would be no forced technology transfers. He also promised better protection of intellectual property. China’s newly appointed central bank head, Yi Gang, also promised to announce reforms to China’s financial industry in the next few weeks. The proposed new tariffs from the U.S. are to be submitted to President Trump in about two weeks. After a final list is published, there will be another 30 days of consultations. That period could leave time for the two sides to work out some compromise. Bill Ide, Saibal Dasgupta and Joyce Huang reported this story for VOA News. Mario Ritter adapted it for VOA Learning English with additional reporting from the AP. Hai Do was the editor.